Virginia wildlife removal is our specialty. Do you have nuisance animal problems and need wildlife removal services in Virginia? Many people are mortified to find that they have nuisance animal pests or some other wild animal occupying their Virginia home and causing extensive damage to their most significant investment. Some homeowners resort to DIY (do-it-yourself) approaches or hire inexperienced or unlicensed “companies” for Wildlife Removal in VA and to resolve their animal wildlife problem in Virginia. We can help – We provide wildlife removal, animal removal, animal trapping, animal capture, wildlife management, animal damage control, animal damage repairs, animal control, crittercontrol, wildlife control and pest control services throughout the Commonwealth of Virginia. Not only do we safely and humanely trap and remove critters that have invaded your home, but we also repair the animal damage they have caused to help keep them out. Our technicians are Virginia State certified, licensed and insured. We are the only company in Central Virginia where are wildlife professionals are NWCOA Bat Standards Certified and WCT Bat Management Trained. If you have Virginia wild animal pests that have gotten into your attic, vents, soffits, eaves, dormers, fascia, walls, ceilings, floors or crawl space, give us a call at (804) 729-0046 or toll-free at (888) 824-7383 for fast service by Virginia’s top rated and most reliable animal removal and wildlife control company. All of our work is backed by our industry leading guarantee. Virginia Professional Wildlife Removal Services is a full-service animal wildlife trapping, animal removal, animal capture, pest control, animal control, and wildlife management company. We specialize in the safest and most humane removal of critters, and urban and suburban wildlife damage management for both residential, commercial and industrial customers. We are state licensed by the Virginia Department of Game & Inland Fisheries. Our animal removal experts handle nearly all aspects of wildlife animal control, and resolve conflicts between people and wildlife in a humane and professional manner. For Virginia pest control of animal wildlife, just give us a call at (804) 729-0046 or toll-free at (888) 824-7383 and we will discuss the control of your wildlife critter problem and schedule an appointment to solve it. We look forward to hearing from you! Running Sounds in the Attic? Scratching Noise in Attic at Night? Noises in the Attic in the Morning? Baby Raccoons in Attic, Chimney or Fireplace? Noises in Attic at Night? Scratching Noise in Walls at Night? Animals chewing holes in the ceiling? Scratching Noises in Your Attic, Walls, Vents, Ceilings, Floors, Soffits, Eaves or Crawlspace? Bats in attic, vents and eaves? Noises in the Attic During the Day? Animals digging holes in ceiling? Animals digging holes in sheet-rock? Scratching Noise in Ceiling at Night? Scratching in Attic in Early Morning? Digging In Your Yard, Field, Lawn or Under Your House, Deck or Garage? Skunks Trapped in a Window Well? We Can Solve All Of Your Animal Removal Problems! Many of Virginia’s wild animals have learned to adapt and even thrive in our homes and businesses. For example some wildlife have found that attics make great places to live. Other animals find refuge under homes, sheds, decks, garages or porches. Invariably, these animals cause damage. Rodents, like squirrels and rats, love to chew on electrical wires once in an attic, and this can causes a serious fire hazard. Squirrels are also notorious for chewing holes in ceilings and damaging sheet rock. 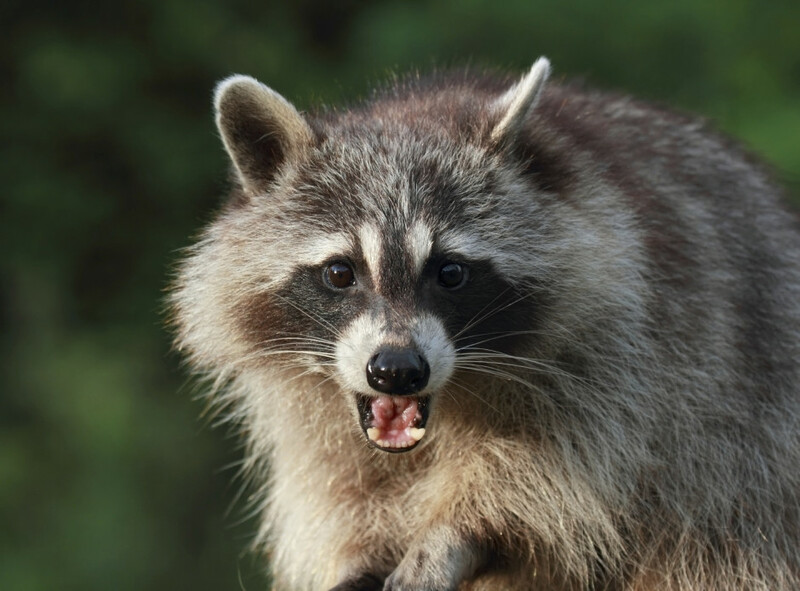 Raccoons can cause serious contamination in an attic with their droppings and parasites. The same goes for bat or bird colonies, bats in the attic is a big problem. We specialize in solving Virginia’s wildlife problems, from snake removal to large jobs like commercial bat control, we do it all in the most safe and cost effective manner. We are here for all of your VA wildlife removal needs. Many homes and businesses in Virginia have problems associated with unwanted nuisance wildlife animals occupying their property. We’re in the business of providing you peace of mind while controlling critters that are bothering you and damaging your property. Our company believes in providing the best solutions available by safely and humanely trapping, removing, capturing, controlling and managing nuisance animal wildlife pests. In addition to animal capture, animal control, animal capture, and animal removal; we provide animal exclusion, damage repairs, waste cleanup, and more. We specialize in humane trapping techniques and complete animal pest control solutions. Basically, if you have a problem caused by the wild animals in your area we can solve it. We work with you to provide the solutions you need at a price you can afford in order to address all of your Virginia wildlife control problems. We are often asked, How much does it cost to remove animal wildlife? Call us at (804) 729-0046 or toll-free at (888) 824-7383 for an immediate wildlife removal cost assessment. We partner with you to solve your wildlife removal and animal control problems. Our wildlife pros can rid your property of BATS, BEAVERS, BIRDS, BOBCATS, CANADA GEESE, CHIPMUNKS, COPPERHEAD SNAKES, COTTONMOUTH SNAKES, COYOTES, DEAD ANIMAL REMOVAL, DEER, EUROPEAN STARLINGS, FLYING SQUIRRELS, FOXES (RED and GRAY), GROUNDHOGS (WOODCHUCKS), MICE, MOLES, MUSKRATS, OPOSSUMS, OTTERS, PIGEONS, POSSUMS, RACCOONS, RATS, RATTLESNAKES, SKUNKS, SNAKES, SQUIRRELS, VOLES, WATER MOCCASIN SNAKES and other unwanted animals in VA.
Our Virginia wildlife removal professionals provide nuisance wildlife removal, animal control, predator control, nuisance wildlife exclusion, critter controls, and wildlife clean-up services. We have experience controlling, trapping, managing and providing bat control, bat removal, beaver removal, bird removal, bobcat removal, Canada geese removal, Canadian Goose Control, chipmunk removal, copperhead snake removal, cotton mouth snake removal, coyote removal, dead animal removal, deer removal, European starling removal, flying squirrel removal, fox removal, groundhog removal, woodchuck removal, mole removal, muskrat removal, pest control, possum removal, otter removal, pigeon removal, rat control, raccoon removal, rattle snake removal, rodent control, skunk removal, non-poisonous and poisonous snake removal, squirrel removal, vole removal, water moccasin snake removal and the trapping of other nuisance species of Virginia wildlife. We operate our business within accepted industry standards and in accordance with local, state, and federal laws. Our company is licensed and insured, and provides both residential and commercial services. We want to be your Virginia wildlife removal company for safe and humane wildlife control in Virginia! We are a full-service wildlife removal company providing animal wildlife trapping, animal removal, animal capture, pest control, animal control, and wildlife management services in counties, cities, towns and communities throughout Virginia. We provide residential, commercial, and industrial animal removal, animal control, animal trapping, animal capture, pest control and wildlife management services in Accomack County, Albemarle County, Alexandria County, Allegheny County, Amelia County, Amherst County, Appomattox County, Arlington County, Ashland, Augusta County, Barboursville, Bath County, Bedford County, Bland County, Bon Air, Botetourt County, Boyd Tavern, Brandermill, Brunswick County, Buchanan County, Buckingham County, Bumpass, Campbell County, Caroline County, Carroll County, Central VA, Charlotte County, Charlottesville, Chesapeake, Chester, Chesterfield County (including Bellwood, Belmont, Bensley, Bermuda Hundred, Hampton Park, Moseley, Bon Air, Brandermill, Chester, Cuckoo, CVille, North Courthouse, Doswell, Dumbarton, Enon, Ettrick, Genito, Glenora, Gordon, Gorduonsville, Harrogate, Hening, Jefferson Davis, Manchester, Motoaca, Meadowbrook, Midlothian, Reams, Robious, Rockwood, Salisbury, South Rockwood, Spring Run, Winterpock and Woodlake), Clarke County, Colonial Heights, Craig County, Culpepper County, Cumberland County , Dickenson County , Dinwiddie County, Earlysville, Elton, Essex County, Fairfax County, Fairfax VA, Fauquier County, Ferncliff, Floyd County, Fluvanna County, Franklin County, Frederick County, Fredericksburg, Giles County, Glen Allen, Gloucester County, Goochland County, Gorduonsville, Grayson County, Greene County, Greenville County, Gum Spring, Hadensville, Halifax County, Hampton, Hampton Roads, Hanover County, Harrisonburg, Henrico County (including Chamberlain, Dumbarton, East Highland Park, Glen Allen, Highland Springs, Innsbrook, Lakeside, Laurel, Lewiston, Montrose, Sandston, Short Pump, Tuckahoe, Wyndham, Fair Oaks and Varina), Henry County, Highland County, Isle of Wight County, James City County, Keswick, King & Queen County, King George County, King William County, Lake Anna, Lake Monticello, Lancaster County, Lee County, Loudoun County, Louisa County, Lunenburg County, Luray, Lynchburg, Madison County, Maidens, Manakin, Manakin-Sabot, Manassas County, Mathews County, Mechanicsville, Mecklenburg County, Middlesex County, Midlothian, Mineral, Montgomery County, Nelson County, New Kent County, Newport News, Norfolk, Northampton County, Northern VA, Northumberland County, Nottoway County, Oilville, Orange County, Page County, Palmyra, Patrick County, Petersburg, Pittsylvania County, Powhatan County, Prince Edward County, Prince George County, Prince William County, Pulaski County, Rappahannock County, Richmond, Richmond County, Roanoke County, Rockbridge County, Rockingham County, Rockville, Russell County, Ruther Glen, RVA, Salem, Sandy Hook, Scott County, Shannon Hill, Shenandoah County, Short Pump, Smyth County, Southampton County, Southwest VA, Spotsylvania County, Stafford County, Staunton, Suffolk, Surry County, Sussex County, Tazewell County, Tidewater VA, Troy, Virginia Beach, Warren County, Washington County, Waynesboro, Westmoreland County, Williamsburg, Wise County, Woodlake, Wyndham, Wythe County, York County, Yorktown, VA and the surrounding areas of Virginia. Call our experts in Virginia wildlife removal services for all of your wildlife removal needs throughout VA, including the Richmond and Charlottesville areas. We repair damage caused by animals and can help prevent animal entry and animal damage in the first place. Don’t let pesky nuisance wildlife take over your home. Give a call today and rid your home of unwanted critters. We actually do what others just say they can do. Need Virginia Wildlife Removal Services? Click here for more information on Wildlife Removal in Virginia. Buyer beware! Nothing upsets us more than seeing a local wildlife removal or pest control company charge for substandard work. This picture is from a job in Richmond VA where a “company” stuffed a squirrel opening on a roof with a white shoe cover and placed a consumer grade mouse bait station beside the opening. Sad and unethical. Our company would not tolerate such work. If you don’t know how to do the job correctly, attend one of the national or local training events. Call one of our wildlife removal or pest control experts at (804) 457-2883. We’ll do the job correctly - guaranteed! Contact Virginia Department of agriculture’s Office of pesticide management enforcement division. It’s apparent they are trying to control gray squirrels with a toxicant that is not registered for gray squirrels. That’ll fix that problem real fast. If I find out this company attended the VWDMA seminar and/or WCOTC this past week I’m gonna drive up there and start kicking asses and revoking graduation certificates. No excuse for this kind of shoddy work. Contact Virginia Department of agriculture’s Office of pesticide management enforcement division. It’s apparent they are trying to control gray squirrels with a toxicant that is not registered for gray squirrels. That’ll fix that problem real fast. DO IT NOW !! Our office received a call about an opossum harassing customers outside a store in Charlottesville during the middle of the day. Many people believe that seeing nocturnal animals out during the day means they are rabid. Simply not true. Contact us for all of your wildlife removal and pest control needs in the Charlottesville area. (804) 457-2883. Almost every snake call that comes into our office comes in as a “Copperhead Snake”. The majority of these calls are usually a juvenile Eastern Rat Snake. Today we received our first verified Copperhead Snake removal call. Below are pictures of the Copperhead Snake provided by the customer in Richmond Virginia. Note the yellowish tip of the tail indicative of a baby/juvenile Copperhead Snake. Doesn’t matter to me. Could be a Little Mermaid snake. It’s still going to meet its maker. Suzanne Watts, you think it was a copperhead??? Do you have openings that lead into your crawlspace? We often find snakes, mice, rats, opossums, raccoons and other critters living in the crawlspace of homes and causing damage. This customer thought she had rats and tried to treat the problem herself with rodenticide (never a good idea). She called us when the dead animal smell in her home became unbearable. Need to remove a mouse from your house? Do you have a family of mice living in your attic or crawlspace? We can help with your mouse removal needs in the Richmond and Charlottesville VA areas. Did you know that a family of 6 mice can produce 50-60 baby mice in 90-days.